The last time you had your hair and makeup done for a special event was probably your prom, and that is not how you want to look like on your Wedding Day. I always recommend our brides to look at Pinterest or Google Bridal Hair Styles. However, you still don’t know if the styles you choose will work with the length and texture of your hair. Put the fear out of your mind. Schedule a trial hair and makeup appointment before your wedding day. Your Bridal Expert will consult with you and the two of you will determine what the best style for your face shape, the texture of your hair, the style of your dress and where your wedding will be held. They will take notes and pictures and will put them in your file for the day of your wedding. 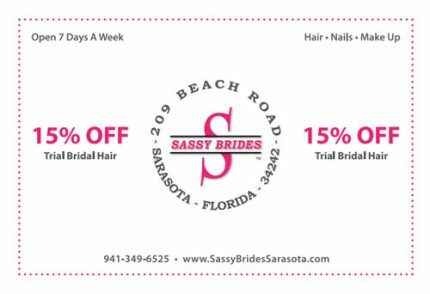 We invite you to use our 15% Coupon for your Trial Bridal Hair Service. Click here to download your coupon. A day does not go by when I talk to a bride regarding makeup services that they are scared they are going to look “UN-NATURAL”. We offer 2 types of makeup services, Airbrush and Traditional Application. To put your mind at ease, have a trial makeup service. I know you will be happy with either service you choose. Why Are Balayage & The Ombre So Popular?